Mages have warred for millennia to create new vistas, build a better world and decide the future of humanity. Now their struggles focus on the most important goal of all - the choice of their own destiny. The keepers of spiritual ways strive to preserve the guttering spark of magic, while the Technocracy ensnares the world in its scientific web. Each visionary has the potential to surpass human limits, to Ascend to a new understanding of the cosmos. But enlightenment comes only to those who can survive their own failings. 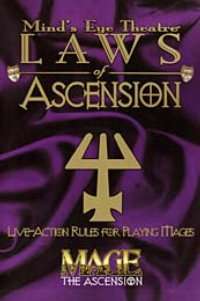 Finally, the definitive guide for playing Mage: The Ascension® as a live-action game. Nine Traditions, nine Spheres and all of the Abilities, Attributes and storytelling ideas you can handle! Everything from the Tellurian to the Technocracy, with all the material you need to begin your own quest for Ascension in Mind's Eye Theatre™.